One of the main problems with watching old, “classic” films is that most of them have, for one reason or another, dated. Most of the time these things can be overlooked by placing the work in its original context and accepting that ideas, attitudes and styles change over time, but there are some genres which date worse than others. The chief amongst these are science fiction and horror, since effects and ideas that were once fantastical and scary can look farcical and silly viewed years or decades later. 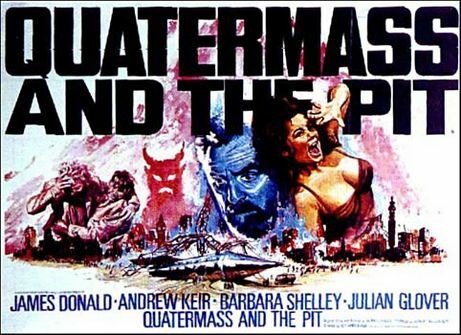 It's a problem that afflicts Quatermass and The Pit, Hammer Studios’ 1967 adaptation of Nigel Kneale’s seminal television serial in which a mysterious metal object is found during excavation work on a London Tube station. As it becomes apparent that the object is not, as originally assumed, an unexploded German bomb, but that it may not be of this Earth, the military try to open it up against the protestations of Professor Bernard Quatermass (Andrew Kier) cool-headed rationalist and the head of the British equivalent of NASA. Considering that this is a horror film about people uncovering a long-buried object, this goes about as well as can be expected. Some of the effects in Quatermass and The Pit have aged very poorly, and the new transfer really shows how fake the actual pit looks. (Though it also highlights the gorgeously lurid colour photography, so sunrise, sunset and all that.) More importantly, they undermine some of the moments that are meant to be scary, such as the times when the object causes people near it to suffer psychological or physical pain, which can only really be demonstrated by having the cast contort their faces like they’ve got particularly painful ulcers or by having them throw themselves around the set like exuberant Star Trek extras as everything around them “shakes”. The overall effect is a lot campier than was probably intended, though that isn’t necessarily bad, because there was always a slightly heightened element to Hammer's work anyway. Besides which, that isn't the worst effect in the film, an honour which is reserved for the contents of the object, which I won't reveal, but will say look hilarious rather than horrifying. Despite this there is an elemental power to Quatermass and The Pit that is hard to ignore. In its quieter moments, such as a scene in which Quatermass is shown around an abandoned house near the pit by a policeman who grew up in the area, and who becomes increasingly uneasy (and sweaty) as he recounts rumours of people seeing ghostly figures and hearing eerie noises, the film is genuinely unnerving. The sense of creeping unease that develops over the course of the story is palpable and it builds steadily to a chaotic and thrilling finale that no amount of dodgy effects could derail. The film is also grounded in an archetypal science fiction story, the strength of which is impossible to ignore. In its revelation that the metal object is a spaceship, and that its creators may have had a role in shaping the development of mankind, it raises a number of potent questions about the nature of humanity, the danger of hubris and the importance of science and logic. Like the very best science fiction, the film raises these questions in a way which is both provocative and entertaining, leaving it up to the audience to read into it what they will. The other aspect of the film that has aged incredibly well is Andrew Keir’s performance as Quatermass. The original Quatermass serials were hugely popular when they aired in the 1950s and Professor Quatermass became one of the first icons of British television. Keir perfectly captures the shaggy nobility and quiet heroism of the character and his belief in the power of science to unite mankind. You care about what he is doing because you care about him, and it is a real testament to Kneale’s original conception of the character and Keir’s performance that this is the case. Keir provides the ideal anchor for a fantastical tale and gives a human face to an extraterrestrial terror.